'Do I really need photos of me getting ready?' is a question I get asked often. 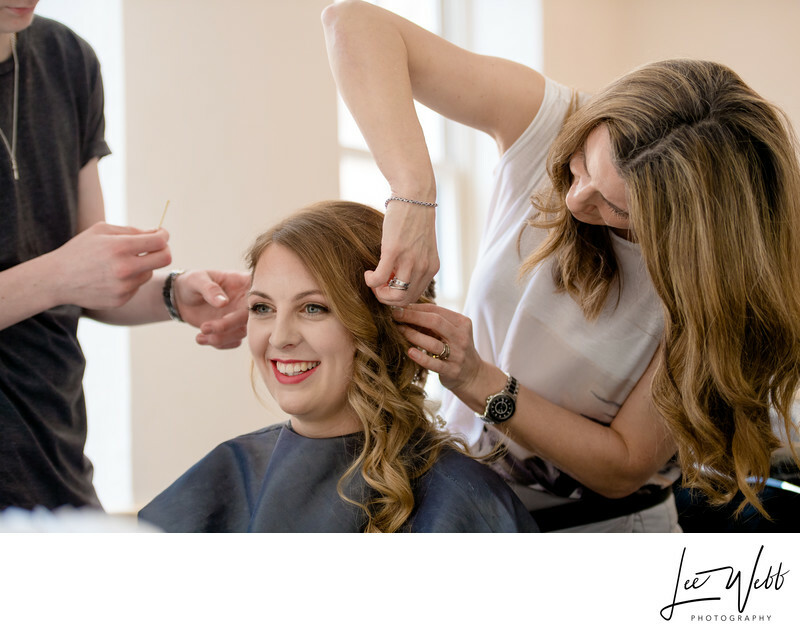 I understand that some people may not enjoy the idea of a photographer snapping away whilst you're having your hair done and your make-up applied, but I really don't think you can fully tell the story of your wedding day without seeing how it all began. Sure it makes my day's quite long (I spent 15 hours with Ailsa on her wedding day!) but photographing the bride getting ready is one of my favourite times of the wedding day. The way the morning evolves is always fascinating, with relative calm early in the morning, to the occasional mad panic when time is running short. 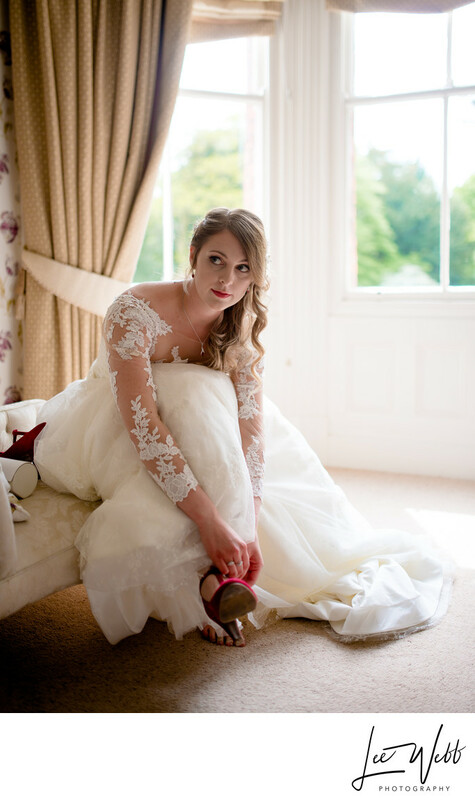 To make the most of her bridal prep photography, and to give herself space to relax, Ailsa hired Katehill House in Bewdley in order to get ready. Katehill House is a magnificent 5-star Georgian mansion, with massive rooms, high ceilings and tonnes of natural light. 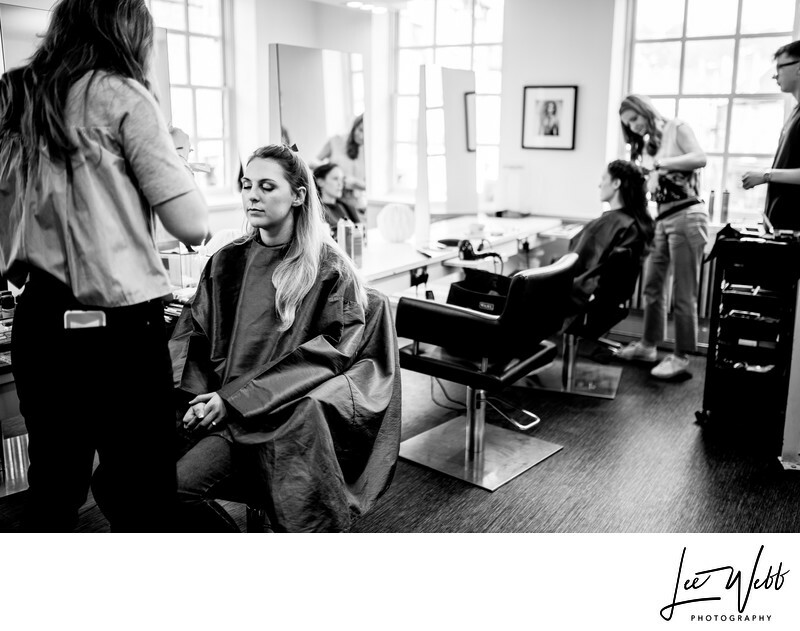 I had spent the whole morning with Ailsa and her 4 bridesmaids, who started their day by having their hair and makeup applied in a private room at Abacus Hair in the centre of town. After a couple of hours of being pampered and sipping champagne, the girls all made their way back to the B&B. I left Ailsa and the bridesmaids alone whilst they got changed, but as soon as it was practical to do so, I re-entered the room in order to get those all important 'finishing touch' photos. 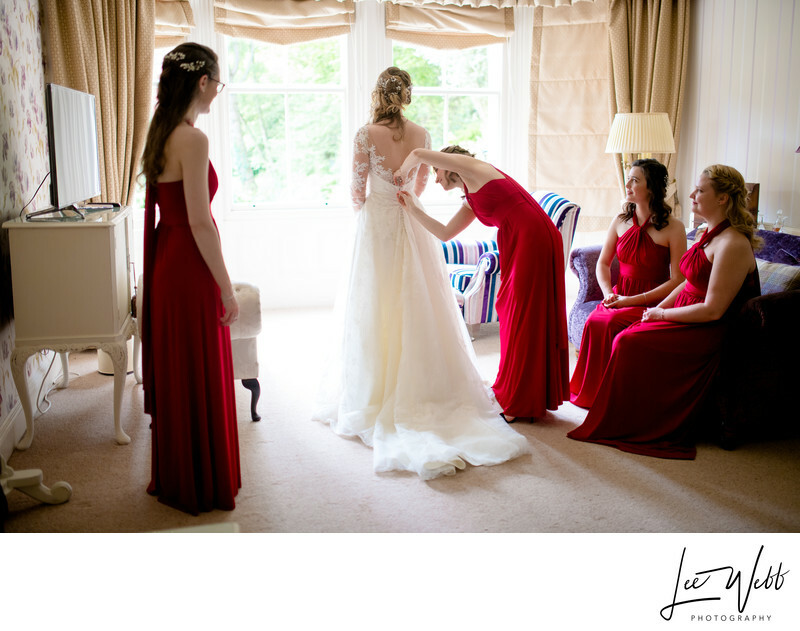 I really like this photo of one bridesmaid helping another with the back of her dress. 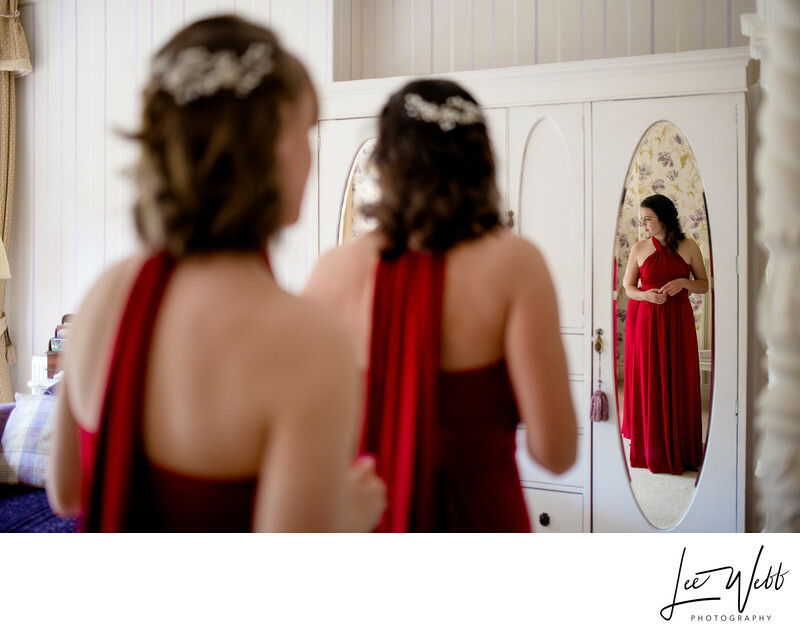 The long oval mirror on the wardrobe meant I could include a reflection of the bridesmaid in the image. The wide open space inside the bridal preparation room meant all of the bridesmaids could be present when the bride was having her wedding dress done up. Ailsa had carefully chosen the colour scheme for the wedding, and deep reds were the order for the day. Red shoes were picked to match the bride's deep red lipstick, as well as her clutch bag, bridesmaid dresses and wedding flowers. In order to get the best light into the room, I had opened the blinds ahead of time. Luckily for me, Ailsa chose to put her own wedding shoes on, whilst sitting on a chaise-longue directly in front of the bay windows. 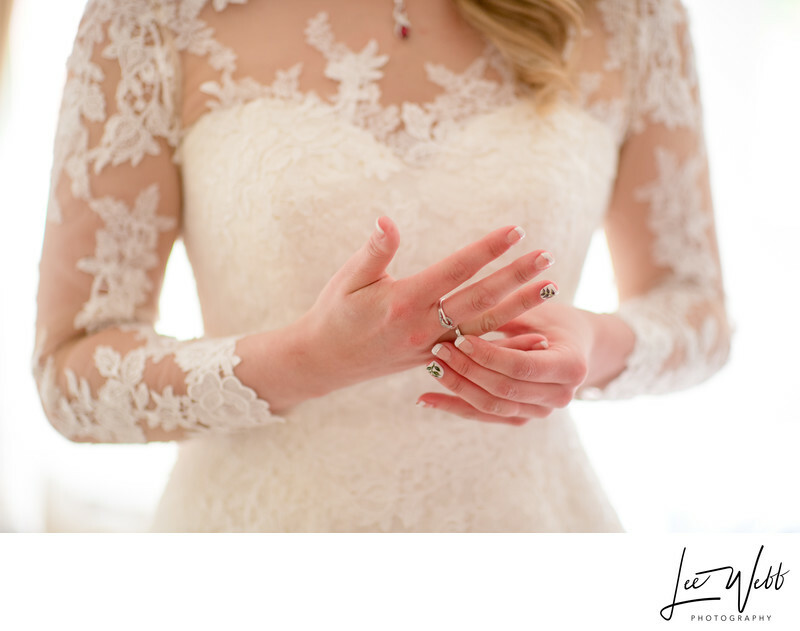 I used one of my favourite lenses, my 35mm f/1.4 and shot away at the widest aperture to create this stunning, dreamy look. I love the tones of this image, with the warm colour of the blinds really working well in the top of the image, and the perfect light being reflected up onto the bride's face from her own wedding dress. One of the bridesmaids had entered the room, and as the bride looked up to see who it was, I grabbed this photo. 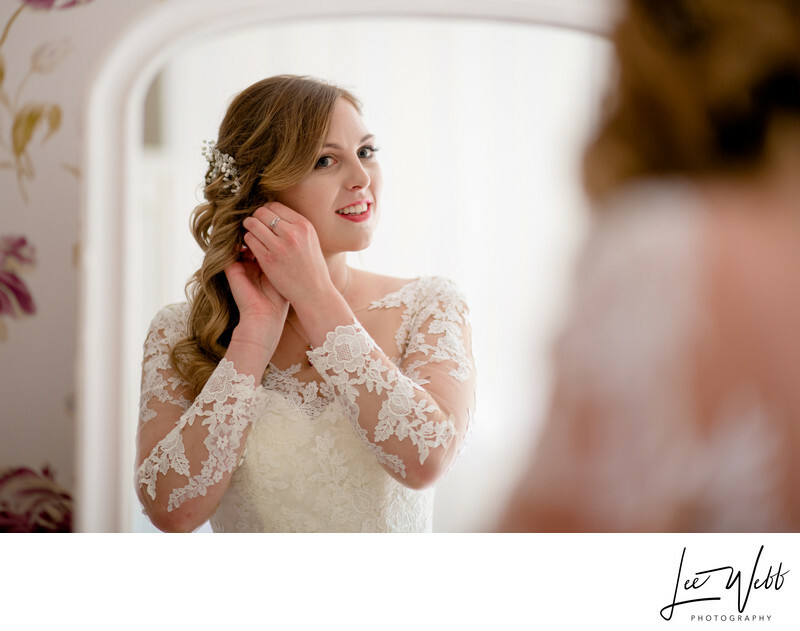 As a large room with huge windows was hired for the bride to get ready in, it really was easy to get stunning yet elegant bridal preparation photos. Soon after, Ailsa made her way to the church where her soon-to-be husband, Ant, was ready and waiting at the end of the aisle. 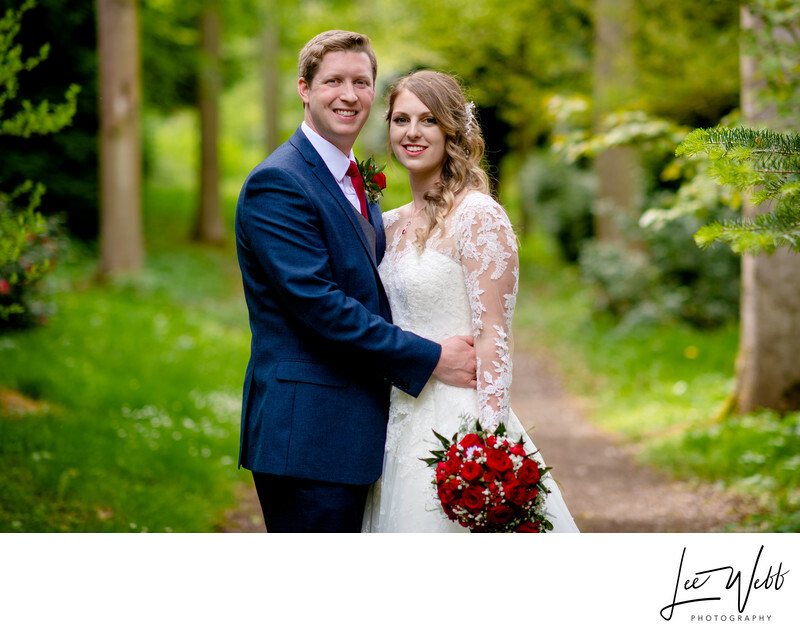 After their marriage ceremony at Rock Village Church, the couple and their guest enjoyed a fantastic reception at Bodenham Arboretum. 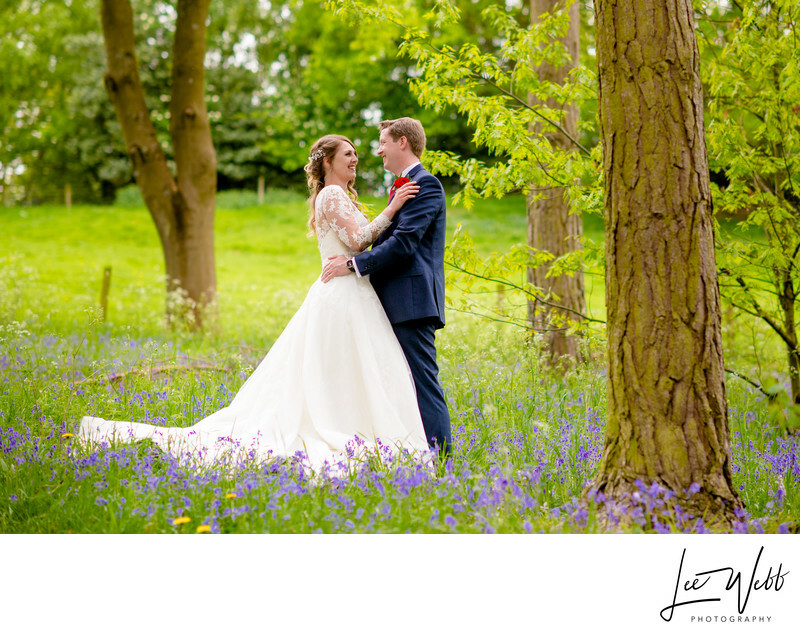 Bodenham Arboretum provided the perfect backdrop for these stunning wedding photos. The rich greens of the trees contrasted nicely against the vibrant reds of the bride's flowers and shoes, as well as the deep blues of the groom's suit. A sea of bluebells had recently come into bloom, which made for a lovely addition to this wedding photo. To visit the Kateshill House website, please click here.